We are a one stop solution for all your cash for trucks needs in Perth. We are the truck wreckers in Perth that pay top dollars for trucks in Perth. We accept all makes and models of trucks and pay top dollar for your truck. Even the condition of the truck doesn’t matter for us. You can sell an accidental truck, junk truck, scrap truck, old truck or unwanted truck. Your truck could be unwanted for any reason, we will buy it. Apart from providing instant cash for cars services, our services are available in local suburbs of Perth for Truck Removal services and Cash for trucks services in Perth with the best cash offers and wider regions of Western Australia. We also service country regions and pay cash for trucks in wider regions and countrysides of Western Australia (T&C apply). Being easily available and one call away from old truck sellers is one of our perks among others. 6. We also deal in used truck parts in Perth. We sell genuine, used, reconditioned parts at affordable prices. These parts are taken from the wrecked trucks. 7. We accept trucks regardless of their make, model, and condition. The make, model and condition may be considered during the evaluation time. But, these three are never the reason for the rejection of any commercial vehicle. 8. Our cash for trucks process is easy, quick, and reliable. The complete process mostly happens in a single day. The seller just has to call us one, our experts will take care of the rest. 9. Our truck experts, being experts in their respective area of work, assist the truck sellers in every step of the truck selling process. 10. The trucks we buy are wrecked to generate the scrap, which is then sold to the industries as a raw material. This way tons of metal is saved only in a few months. Your truck also plays part in the conservation of the environment. Rest assured, your trucks are disposed of in an environment-friendly way. Our Trucks Wreckers Perth Services are fully licensed and available to the old trucks owners in Perth and the wider regions of WA. Our truck wrecking services are for the customers who want to wrecker their trucks and require free truck removal in Perth services for the truck removal Perth. Sell your truck to A1 Malaga Auto Dismantlers. 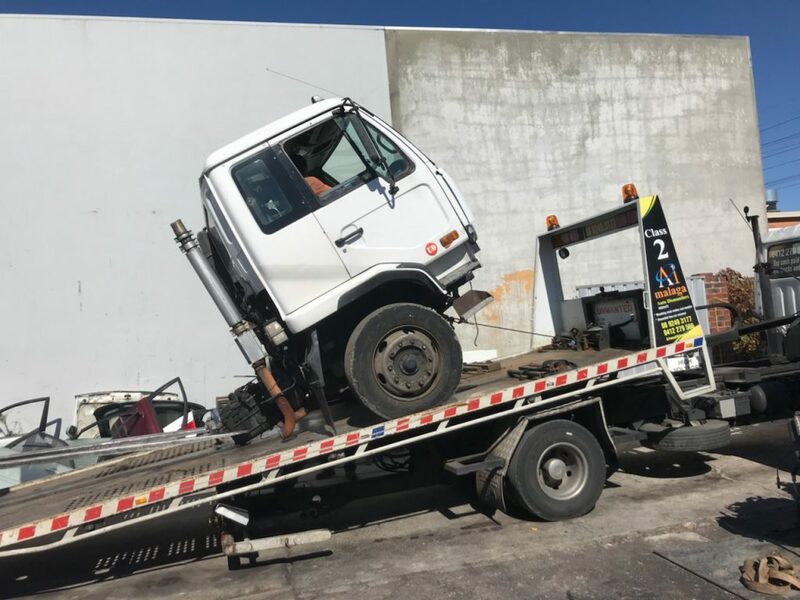 We, the leading commercial wreckers, offer free truck removal services in Perth across the northern and southern regions of Perth and wider Western Australia. Our truck salvage services are available for all makes and models and all conditions of trucks and pay cash for trucks in Perth. We accept the below models of undamaged and damaged trucks, however not limited to them only. If you have a truck of a brand that is not mentioned in the above list, don’t worry, we have not mentioned a brand but we accept trucks of all brands. Our free truck removal services are also available in country regions of WA (T&C Apply). Give us a call to discuss our free truck removal services and cash for trucks services in Perth. We offer free quotes for all your cash for truck needs. We also deal in high-quality and affordable truck parts in Perth. Our services are fast and reliable, we offer quick truck removal services and pay top dollars for all makes and models of trucks and minivans. We believe in paying cash instantly. We also accept any condition of the unwanted truck, scrap trucks for cash in Perth.